It was -3 F (-19 C) when my daughter went out to the bus this morning. That is just plain ridiculous. And have I ever mentioned that my husband works outside? He called me at lunchtime and, in his slightly understated way, said that yes, he was a bit chilly. They have been instructed to leave their trucks running all the time. He is going to be frozen solid by the time he gets home. I, however, have one more day at home before I go back to my regular schedule. So, right now the house is filled with the scent of the gingerbread that just came out of the oven and I am surrounded by stacks of books. In other words, life is pretty good. I have the stack of books I am currently reading, the very large stack of books I bought on my vacation in London, and the stack of favorite books from 2017. The living room is being taken over by books which is just the way I like it. I have mixed feelings about my reading over the last year. It was a rough year in many ways and I have issues with wasting a good book on a bad day. I know that theoretically, a good book can improve a bad day but I find that it just means I don't fully appreciate the good book. Since this year was filled with a lot of not-so-great days my book choices for the year are not as spectacular as I would like. That being said, I highly recommend all these books. They stood out from the many slightly mediocre books I read over the last year. As usual, re-reads are not allowed on this list. I will link to blog posts where I talked about these books but, also as usual, I don't do well at posting straight book reviews so many of these books were never mentioned at all even though they probably deserved blog posts of their own. I started out the year on a high. Chatterton Square by E.H. Young was a wonderful book. I have read a number of her novels and have enjoyed all of them. This book about the interaction between two families who live on the square might possibly be my favorite. The quiet character development and incisive writing is a joy to read. I loved it so much I actually wrote a blog post about it here. Bricks and Mortar by Helen Ashton is a Persephone book so I really don't think I need to say much more about it. Many of us know and love them. It follows the lives of one family from the 1890s through the next 40 years or so. A quiet, domestic novel but so much more as well. I want to pull it off the teetering pile and reread it right now. I do mention it in a post of mini-reviews here. The Home-Maker by Dorothy Canfield Fisher was a book I could not stop thinking about and for that reason alone it deserves a place on my list. The story of the Knapp family addresses a lot about society's expectations and the role of women in and out of the home. It was a book ahead of its time and one that is definitely worth reading. I had a lot to say about it here. Letters From Constance by Mary Hocking is a book I did not write about but I kept meaning to if that counts for anything. Constance and her childhood friend Sheila promise to keep in touch after they leave school and they do so through letters for the next forty or more years. The book only has one half of the correspondence which leaves tantalizing gaps in the reader's knowledge of events. I found it enthralling and it made me determined to read more of Hocking's novels. Minnie's Room by Mollie Panter-Downes is another Persephone book. I absolutely adore her One Fine Day so I was very excited to read this volume of her short stories. I don't think it was quite as strong as some of her others but I loved it and will be reading it again. 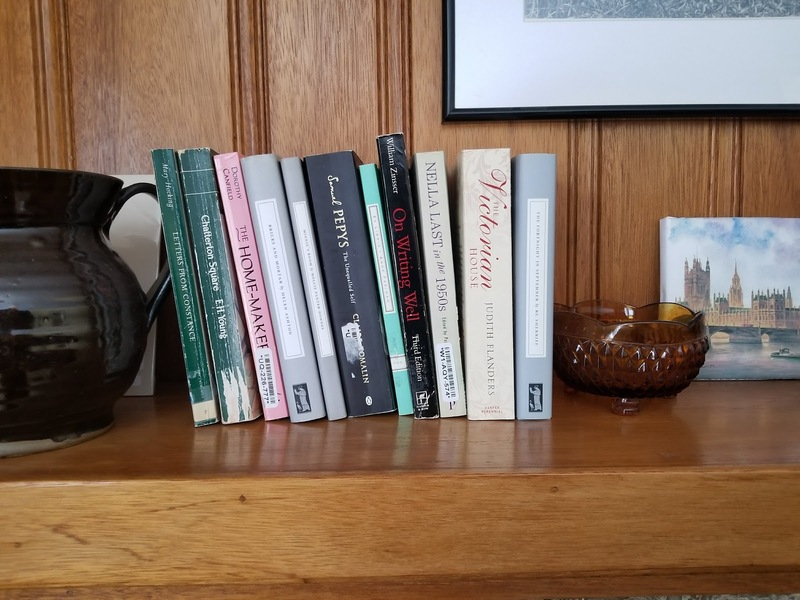 Samuel Pepys--The Unequalled Self by Claire Tomalin was recommended by someone on Instagram after I raved about Tomalin's biography of Jane Austen. I didn't know I was interested in Pepys until I read this. What a fascinating man. I stumbled across a multi-volume set of his diaries right after reading this and was only prevented from buying it by the fact that I couldn't carry it around Boston for the rest of the day. Tomalin does a fantastic job of packing this full of fascinating and very readable information. I have her biography of Charles Dickens waiting on the shelves for me. On Writing by William Zinsser was originally loaned to me by my dad but I enjoyed it so much I went out and bought my own copy. He makes writing seem so accessible, so doable. This book is full of sticky notes to mark passages I particularly loved which is always a sign of a good book. My post about it is here. Books about books are some of the best kinds of books. If that is your thing then read Ex Libris by Anne Fadiman. Her love of books is a joy and you will find yourself nodding in agreement, thoroughly pleased to have met someone who loves books as much as you. My review of it is here. Nella Last in the 1950s edited by Patricia and Robert Malcolmson is the last volume of Nella Last's diaries. I read the previous two volumes a number of years ago and I don't know why it took me so long to get around to this volume. I love her voice and have nothing but admiration for her writing. I quote a passage from her diaries here. The Victorian House by Judith Flanders was an impulse purchase and I am so glad I gave in to that impulse. If you have ever wanted to know what it was like to live during Victorian times then this is the book to read. Questions it never occurred to you to wonder about will be answered. I believe she also wrote a book about the Victorian City and I want to read that soon. I wrote a review of The Victorian House here. The Fortnight in September by R.C. Sherriff was one of the last books I read in 2017 and it ended the year on a high note. It is yet another Persephone book and it entirely lived up to my expectations. It is the very simple story of the fortnight's holiday the Stevens family takes to the seaside at Bognor every year. To be honest, not much really happens but that is the beauty of the book. He takes ordinary, everyday people and makes them and their joys and worries real. Reading this book felt a bit like peeping through a window at a bygone era but, at the same time, the Stevens family was so alive. Read this. I loved it. The last book on my list is A Chelsea Concerto by Frances Faviell. I read it on my Kindle so it isn't included in the photo. I know a lot of bloggers read this last year but I only recently got around to it which is surprising since accounts of life in Britain during WWII are a bit of an addiction of mine. This was very well done. I recognized some of the passages as having been quoted in other books about the time period. It was heart-wrenching and well worth reading. I might possibly need to buy a physical copy which is something I tend to do for anything I read on my Kindle and think is particularly good. So there you have it. My top twelve books of 2017. Have you read any of these? Do any sound like books you would like to read? R. C. Sherriff is one of my favorite writers. I've loved every one of his books I've read. I also adore Nella Last. I read her diaries and then bought them to read again, something I almost never do. I once had a 12 or 13 volume set of Pepys' diaries. I traded them at the used bookstore, but almost every year I vow to read his diaries on line, one or two entries a day. But I never continue after the first few weeks. I agree with you that a good book can be less than it is if you read it when you're stressed and distracted. I know that's happened to me several times. This was the first Sherriff book I have read but I will definitely be looking for more. It was so good. Do you have another one you particularly recommend? I should look for Pepys online. I know I won't read it every day, though that sounds interesting, but it would be a fun thing to dip in and out of. I started reading Sherriff with The Hopkins Manuscript. It's science fiction, but it's the only kind I like to read, the kind that takes place on Earth, not in outerspace. Greengates and Chedworth are more like The Fortnight in September. Any Sherriff I've read so far was good. Thank you for the suggestions. I just ordered a copy of The Hopkins Manuscript. And thanks for the link to Pepys. That should keep me nicely entertained on this very cold day. Such a wonderful selection of books, most of which I've read and loved! Ex Libris holds a special place in my heart because it was my first ever completely spontaneous New Book purchase (as opposed to planned before I went to the bookshop) and it certainly didn't let me down. Ex Libris was an impulse purchase for me as well. I am so glad I gave in to the impulse. It was a joy to read. Thanks for the wrap up. I can't wait to get a few of these titles. I hope you enjoy whichever you choose to read. I'm very happy to see Dorothy Canfield on your list! I haven't read most of the others (except for Mollie Panter-Downes), so I will be taking notes. The Victorian House will be first on my list, I think. I believe I bought The Home-Maker because you spoke so highly of it. The Victorian House was fascinating. I think you will enjoy it. Just discovered your blog via Twitter, and like your taste in books, so have just followed. I haven't read most of the titles you mention, but am trying to rectify the gender balance in the authors I do find time to read. I know a Sherriff's WWI play, and enjoyed C Tomalin's biog of J Austen. Thank you for commenting and following! Tomalin's biography of Jane Austen was fascinating, wasn't it? I heartily recommend the Sherriff book. I know I will be looking for other books by him. What wonderful reading you had - and books published in the last decade don't feature much in it. That may say something about the quality of writing - or maybe the subject matter - currently being produced. I have been looking for Mollie Panter-Downes and Dorothy Canfield Fisher books for years, but they are not in any library I have access to, nor have I found them used. I may have to break my own rules and buy a "new" book! Thanks for reminding me of my search. You absolutely must read One Fine Day by Mollie Panter-Downes! I think it is wonderful. Hmmm, you are right. All my favorite books are older. However, my first book of this year was printed in 2017 and I loved it. So maybe my next list of favorite books will cover a wider time frame. What a wonderful collection! Coincidentally, I've just treated myself to a copy of A Chelsea Concerto using a Christmas gift card so it's wonderful to hear how strongly you feel about it. What a wonderful treat for yourself! I hope you enjoy it. About your husband's job: I had a coworker whose husband worked as a refrigerated truck driver in upstate NY. Sometimes it got so cold, he would go in the refrigerated part to warm up. It is nice to hear from you again. Yes, read the Tomalin bio. So interesting. I just today started her bio of Charles Dickens.